Sulfur-containing compounds in crude oil, petroleum, diesel and other fuel oils include sulfides, thiols, thiophenes, substituted benzo- and dibenzothiophenes (BTs and DBTs), benzonaphthothiophene (BNT), and many more complex molecules, in which the condensed thiophenes are the most common forms. Hielscher ultrasonic reactors assist the oxidative deep desulfurization process required to meet the today’s stringent environmental regulations and ultra-low sulfur diesel (ULSD, 10ppm sulfur) specifications. Oxidative desulfurization with hydrogen peroxide and subsequent solvent extraction is a two-stage deep desulfurization technology to reduce the amount of organosulfur compounds in fuel oils. Hielscher ultrasonic reactors are used at both stages to improve phase-transfer reaction kinetics and dissolving rates in liquid-liquid phase systems. At the first stage of ultrasonically assisted oxidative desulfurization, hydrogen peroxide is used as an oxidant to selectively oxidize the sulfur-containing molecules that are present in fuel oils to their corresponding sulfoxides or sulfones under mild conditions to increase their solubility in polar solvents with an increase in their polarity. At this stage, the insolubility of the polar aqueous phase and the nonpolar organic phase is a significant problem in the process of oxidative desulfurization as both phases react with each other only at the interphase. Without ultrasonics, this results in a low reaction rate and a slow conversion of organosulfur in this two-phase system. Refining installations require heavy-duty industrial equipment, fit for high volume processing 24/7. Get a Hielscher! The oil phase and the aqueous phase are mixed are pumped into a static mixer to produce a basic emulsion of a constant volumetric ratio that is then fed to the ultrasonic mixing reactor. In there, ultrasonic cavitation produces high hydraulic shear and breaks the aqueous phase into sub-micron and nanosize droplets. As the specific surface area of the phase boundary is influential for the chemical rate of reaction this significant reduction in droplet diameter improves the reaction kinetics and reduces or eliminates the need for phase-transfer agents. Using ultrasonics, the volume percentage of the peroxide can be lowered, because finer emulsions need less volume to provide the same contact surface with the oil phase. Ultrasonic cavitation produces intense local heating (~5000K), high pressures (~1000atm), enormous heating and cooling rates (>109 K/sec), and liquid jet streams (~1000 km/h). This extremely reactive environment oxidizes thiophenes in the oil phase faster and more completely to greater polar sulfoxide and sulfones. Catalyst can further support the oxidation process but they are not essential. Amphiphilic emulsion catalysts or phase-transfer catalysts (PTC), such as quaternary ammonium salts with their unique capability to dissolve in both aqueous and organic liquids have been shown to incorporate with the oxidant and transport it from the interface phase to the reaction phase, thereby enhancing the reaction rate. Fenton’s reagent can be added to enhance the oxidative desulfurization efficiency for diesel fuels and it shows a good synergetic effect with the sono-oxidation processing. When the organosulfur compounds react at a phase boundary, the sulfoxides and sulfones accumulate at the aqueous droplet surface and block other sulfur compounds from interacting at aqueous phase. The hydraulic shear caused by cavitational jet streams and acoustical streaming result in turbulent flow and material transport from and to droplet surfaces and leads to the repeated coalescence and subsequent formation of new droplets. As the oxidation progresses over time, sonication maximizes the exposure and interaction of the reagents. After the oxidation and the separation from the aqueous phase (H2O2), the sulfones can be extracted using a polar solvent, such as acetonitrile at the second stage. The sulfones will transfer at the phase boundary between both phases to the solvent phase for their higher polarity. 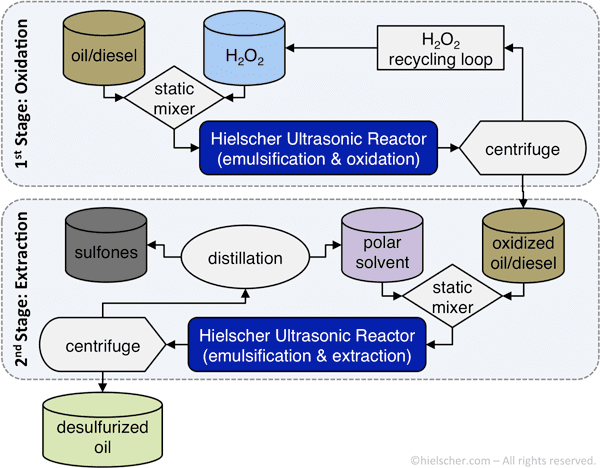 Much like at the first stage, Hielscher ultrasonic reactors boost the liquid-liquid extraction by making a fine-size turbulent emulsion of the solvent phase in the oil phase. This increases the phase contact surface and results extraction and reduced solvent usage. Hielscher Ultrasonics offers equipment to test, verify and utilize this technology at any scale. Basically it is done in 4 steps, only. At the lab scale, you can use a UP200Ht to demonstrate the concept and to adjust basic parameters, such as peroxide concentration, process temperature, sonication time and intensity as well as catalyst or solvent usage. At bench-top level a UIP1000hd, allows to simulate both stages independently at flow rates from 100 to 1000L/hr (25 to 250 gal/hr) and to optimize process and sonication parameters. Hielscher ultrasonic equipment is designed for linear scale-up to larger processing volumes at pilot or production scale. 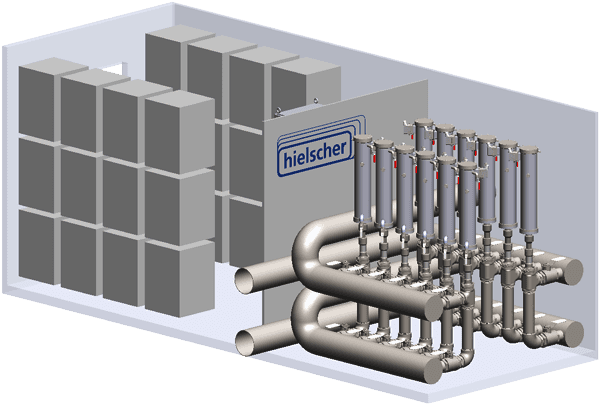 Hielscher installations are proven to work reliably for high volume processes, including fuel refining. Hielscher produces containerized systems, combining several of our high power 10kW or 16kW devices to clusters for easy integration. Designs to meet hazardous environment requirements are available, too. The table below lists processing volumes and recommended equipment sizes. UAODS offers significant advantages compared with HDS. Thiophenes, substituted benzo- and dibenzothiophenes are oxidized under low temperature and pressure conditions. Therefore, expensive hydrogen is not required making this process more suitable for small and medium size refineries, or isolated refineries not located close to a hydrogen pipeline. The increased reaction rate and mild reaction temperature and pressure avoid the employment of expensive anhydrous or aprotic solvents. Integrating an ultrasonically assisted oxidative desulfurization (UAODS) unit with a conventional hydrotreating unit can improve the efficiency in producing low and/or ultra-low sulfur diesel fuels. This technology can be used before or after conventional hydrotreatement to lower the sulfur level. The UAODS process can lower the estimate capital costs by more than half when compared to the cost of a new high-pressure hydrotreater. While hydrodesulfurization (HDS) is a highly efficient process for the removal of thiols, sulfides, and disulfides, it is difficult to remove refractory sulfur-containing compounds such as dibenzothiophene and its derivatives (e.g. 4,6-dimethydibenzothiophene 4,6-DMDBT) to an ultra-low level. High temperatures, high pressures, and high hydrogen consumption are driving up the capital and operating costs of HDS for the ultra-deep desulfurization. High capital and operating costs are inevitable. 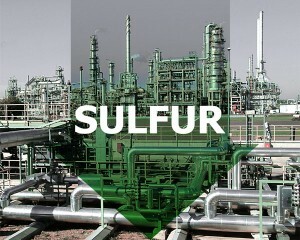 Remaining trace levels of sulfur can poison the noble metal catalysts used in the re-forming and transforming process or the electrode catalysts used in fuel cell stacks.